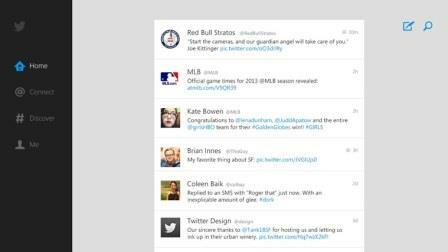 Twitter Launches Application for Windows 8: Twitter app for Windows 8 operating system is now available. Besides the typical characteristics, which has applications for other platforms micro-blog network, also includes some features that leverage the functionality of Windows 8. The new app offers more speed and a different way to use and enjoy Twitter. The application has new features that take advantage of the features of Windows 8 but also has tabs classics like Connect, Home, Discover or Account. One of the new features is that you can set the application side in order to make way for the user to continue watching videos, browsing the Internet or using other applications. The application can be set to one third, two thirds, or full screen. In addition, the user will never miss any of Twitter since you can configure the Windows 8 tiles to see at all times the status of the account, the new ‘tweets’ or mentions and conversations. For viewing photos has opted for a larger view and occupy the center of the screen, for this you just have to click on the picture and it will open. Discover tab and under Account, you can slide your finger horizontally from the right side of the screen to view multiple images at a time. Furthermore, this application makes it easier to share content on Twitter. Simply slide your finger horizontally from the right side of the screen and a small display of Twitter, on the right side, where you can choose how to share, and write a little comment on that page or photo. As for searching for users or words in the application now can be done by sliding your finger from the right side of the screen and selecting what words you want to search the social network. Twitter for Windows 8 is now available in the Windows Store in 22 languages.